Create striking colorwork and beautiful faux cable designs with Brioche Chic! Author Mercedes Tarasovich-Clark introduces you to the beauty that is brioche with this inspiring collection of 22 garments and accessories for women and men. These smart, fashionable designs are a great way to advance your knitting skills with this unique style of knitting! Starting with the basics, Brioche Chic offers mini collections of garments revolving around a specific set of techniques. Mercedes will show you how the basic rib pattern can be adapted to simple motifs, lace, and various textures. Start by casting on the Basic Brioche Scarf and in no time you’ll advance to projects like the Chevron Deep V Pullover. Explore brioche cable techniques with Mercedes’ expert guidance through the great patterns found in the Brioche with a Twist chapter. 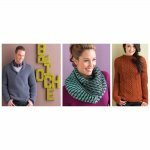 Knitted pullovers, cardigans, accessories and more are beautifully embellished with each cabled stitch. Advance further still into the possibilities that brioche stitch holds with fabulous two-color projects too! 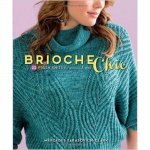 Brioche knitting gives you designs and techniques that make for striking, flattering, creative, colorful, and wearable knitted projects. So, whether it’s a project that features all-over brioche, or one that blends it seamlessly with stockinette for a more traditional look, there is something for everyone in the pages of Brioche Chic.